Germander is a collective term applied to many members of the Teucrium genus in the mint family, Lamiaceae. American germander is a perennial herb, T. canadense, that also goes by the names wood sage and wild basil. It’s native to North America. The common name ‘wood sage’ is also used for a yellow-flowering related herb, T. scorodonia, that is native to Europe and now naturalized in North America. T. fruticans is a European shrub known as tree germander. It can be found on coastal hillsides in Europe. Tree germander is planted in gardens for its evergreen-like foliage. Creeping and upright varieties may be available at nurseries with a wide selection. Plants grow from one to three feet tall and they’re found naturally in thickets and woodlands. It grows best in full sun but can accept a partially shady location. During Elizabethan times in England germander was planted in the knot gardens as a dark green contrast to leafy herbs. The plant looks like a tiny version of an evergreen hedge so it was planted in such a way as to resemble knotted ribbons, especially when viewed from above. American germander has square stems that are downy and topped with spikes of pastel colored flowers. The lipped flowers can be purple, pink or whitish, though pink is most common. Four stamens protrude from a split or cleft in the upper lip. The whole calyx, or base of the flower tube, feels velvety. The blooming period is early to late summer. The toothed, opposite leaves are variable having a broad to narrow, oval or lance shape with pointed tips. The leaves are hairy underneath giving the undersides a whitish color. Historically, a leaf tea was used to treat irregular menses and to induce urination and sweating. Several germander species are strong diuretics that were used in the treatment of gout. Germander tea can be used in a compress or the whole leaves in a poultice as an antiseptic dressing. The tea can be gargled for sore throats and coughs to take advantage of its antiseptic properties. Although there are useful medicinal properties of the herb germander, it has been replaced over time with more effective treatments. Germander has high toxicity due to the fact that several cases of liver damage, hepatitis, and even death have been attributed to ingesting germander. Take caution: any perceived benefits are not worth the risk of using germander in any kind of herbal treatment. 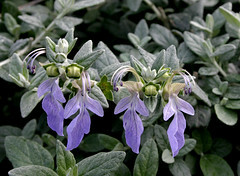 Note that it is often found as an adulterant in skullcap, which has been used as a nerve tonic and antispasmodic. I am curious about the wild variety I have found in Reading PA. I have a few pics of it I wish to show and get a positive ID. I am interested in it as a possible external rinse or soak and the bennifits, as I have a rare form of M. S. I go through feet swelling, pain, water retention, over active nerves etc. Would this plant help me as a some for my feet? I’ll try to help you find a positive ID on your plant. Please send photos to herbie@usethatherb.com. I’m curious what other herbs or treatments you’ve tried for the M.S. ?